Hi, I am interested in your 1971 Chevrolet Chevelle (stock #1282-NSH) listed on Autotrader for $61,995. I'd like to get more information about this vehicle and confirm its availability. If you are looking for a car that will really turn some heads, then take a look at this tricked out Chevelle. Its built for thundering down the road on sunny days as well as showing off at club gatherings and car shows. Check it out. Its hard to tell what will grab the attention of the crowds first as you roll down the road. It may be you and your friends acting cool with the top down as you roll slowly into town. If its a sunny day, and you see people reaching for their sunglasses, it may be the Sunflower Yellow paint theyre checking out. It shines bright and looks good as the light reflects off the smooth lines of the body and especially the muscular curves of the rear fenders. Leading the way up front is another sign of that muscle. An SS badge in the center of a black grill that is trimmed in chrome and underlined by sharp looking bumper. Black SS stripes flow back and up the hood and there is another SS badge on the front fenders. Chrome trims out the wheel wells that have the other thing that will grab peoples attention. The 24 , black and chrome, Forgiato wheels that are tucked up under there. Open the door and you will find a neat and clean Black interior that compliments those wheels and the SS stripes perfectly. The door panel has a center section of vertical pleats outlined in chrome both top and bottom with an SS badge toward the front. The front bucket seats are nicely upholstered, and, being a mid-sized muscle car means that there is plenty of room in the back seat to load up a few extra friends for cruise night. A two-spoke steering wheel sits in front of a dash that is mostly stock, but with a couple nice additions. The first one is as set of auxiliary gauges to keep accurate track of critical engine functions like water temp, oil pressure and voltage. The other is a Pioneer head unit that is AM/FM/CD/iPod and Bluetooth compatible. Now go pop the trunk for a little surprise. 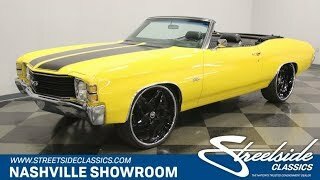 It is nicely set up to pump out the sound from that head unit and is tricked out with a custom bowtie in the center and Chevelle in black and yellow. Pop the hood and you will find the other sound system in the car. It is a 454 cubic inch powerhouse that pumps out some ground pounding bass through long tube headers and Magnaflow mufflers. It sounds great when you turn up the volume with the gas pedal! The engine is nestled down in a neat and clean engine bay and is dressed up for the show too. A chrome air topper sits on a Holley 4-barrel carburetor and an Edelbrock intake manifold. Chrome valve covers as well as the alternator add their splash of flash while an MSD ignition system gets good spark to the cylinders through a set of red plug wires. Power flows back through a 3-speed automatic transmission and 12-bolt rear end mounted on coil springs with trailing arms. Up front, coil springs and power front disc brakes provide good stopping power and the rubber meets the road through 275/25/24 tires mounted on those gorgeous Forgiato alloy wheels. Summer is coming! Get ready for it with this unique Chevelle that is sure to turn some heads. Come on down and check it out.